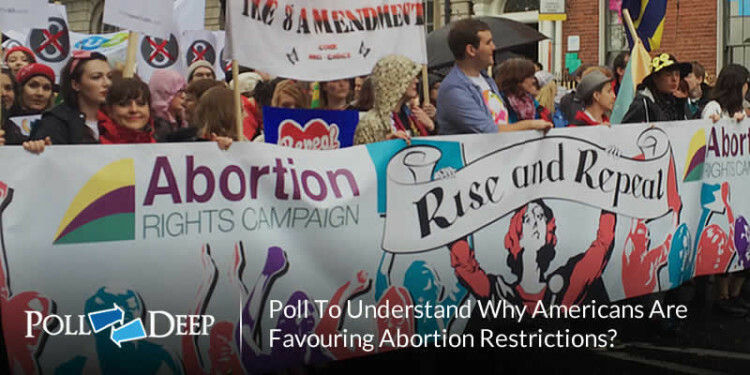 Home » Blog » Online Polls » Poll To Understand Why Americans Are Favouring Abortion Restrictions? Abortion, a very sensitive and controversial subject that has seen the rise of different factions and school of thoughts with differing opinions and interpretations over the years. While some factions (anti-abortion movement) believes that abortion is morally wrong, bad and should not only be condemned but also removed from the law and categorized as murder, other factions believe abortion is the best way to prevent explosive growth rate and poor standard of living. However, the faction that supports abortion all have a different opinion on the amount of access or restrictions the abortion laws should have. A recent poll carried out on over 5,000 individuals in order to get their views on whether any form of restrictions or limits should be passed on the abortion laws in order to prevent all forms of late pregnancy termination saw 75% of them voting for some substantial abortion restriction access while only 20% voted for the abortion law to be fully scrapped and made illegal. 10%, on the other hand, voted for the unrestricted access of abortion for anyone interested at any stage of pregnancy. These varying results have helped us understand the mind of the American population at large even as the battle to increase abortion restrictions rages on among the lawmakers and within various states. When our participants were asked about what influenced their decisions the most to seek for more restricted abortion law, more than 85% of the respondents attributed it to the rise of abortion rate among teens and the various health issues and complications that might arise from a late pregnancy termination. Others believed late pregnancy termination are morally wrong because by this time the fetus is fully formed (usually thought to be around 25 to 26 weeks) and a living breathing child as already taking shape. This stance has also been seen among various law bodies and government organizations as the legislature keeps passing regulations that are in favor of more aggressive abortion restrictions and high compliance standards for abortion clinics all across the country. These restrictions have invariably led to more and more abortion clinics shutting down and going out of business as they find it difficult to practice. Research on the population niche and the population of women that are likely to be affected by these aggressive abortion restrictions are the young, poor and mostly unmarried nonwhite teens. A recent poll obtained saw that about 58% of women obtaining abortions are in their 20s, while only 20% 0f these women were White, 50% of them were Black women and 30% were Hispanic women. These same report also showed that the number of unmarried women who went for abortion was the highest with over 80% of women, about 60% of them already had one child and 34% already had two or more. According to one of our respondents who believes that no limitations should be placed on abortion access, he said, “These young minorities run to abortion as the final solution to erase mistakes and avoid raising their cost of living by bringing in a child to the world. But with the constant passing in law of various abortion restrictions, these women might find it difficult to do this and this can lead to various problems in the society”. With the help of online polling tools you can get different opinions from people around the world. The free online polling tools such as www.polldeep.com are one of the most loved polling tools.